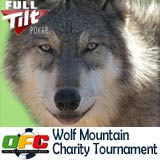 Erica Schoenberg will be playing in the OFC Wolf Mountain Sanctuary Charity Tournament to be held at Full Tilt Poker on Saturday, December 5th, 2009 at 3pm EST (GMT -5). The winner of this tournament will receive a bonus prize of a Mexican Riviera Poker Cruise, courtesy of CardPlayer Cruises. The $1 + $10 tournament aims to raise money and bring awareness to Wolf Mountain Sanctuary, a non-profit animal rescue organization. Top players will also be awarded gift certificates courtesy of ALL IN Clothing Company. The player who eliminates Erica Shoenberg will win a one year PPA Online Premium Membership to the Poker Players Alliance. Full Tilt Poker will be providing additional prizes. The charity event kicks off Online Forum Challenge’s 3rd Annual World Series Of Online Forums, in which one player is guaranteed to win a $12,000 WSOP Main Event Package. Full details for the Wolf Mountain Sanctuary Charity Tournament and the entire World Series Of Online Forums are available at www.wsoof.com.